FALL RIVER, Mass. 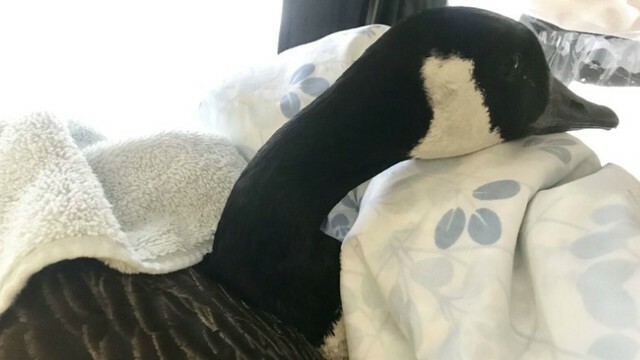 (WPRI) — A goose that was found in Fall River with an arrow through its chest has undergone surgery. The goose's situation was brought to the attention of Fall River Animal Control by a concerned resident more than 10 days ago. Animal Control officers spent several days attempting to catch the goose but since it was still able to run and fly, it continuously evaded capture. Two staff members from the Massachusetts Division of Fisheries and Wildlife caught the goose off Cook Pond Wednesday afternoon and transported it to the Cape Cod branch of the New England Wildlife Center. A spokesperson from the Wildlife Center tells Eyewitness News the surgery to remove the arrow was a success but the goose's prognosis is still uncertain.